Recipe from Mary Wilson, Speaking of Women’s Health Celebrity Spokeswoman. 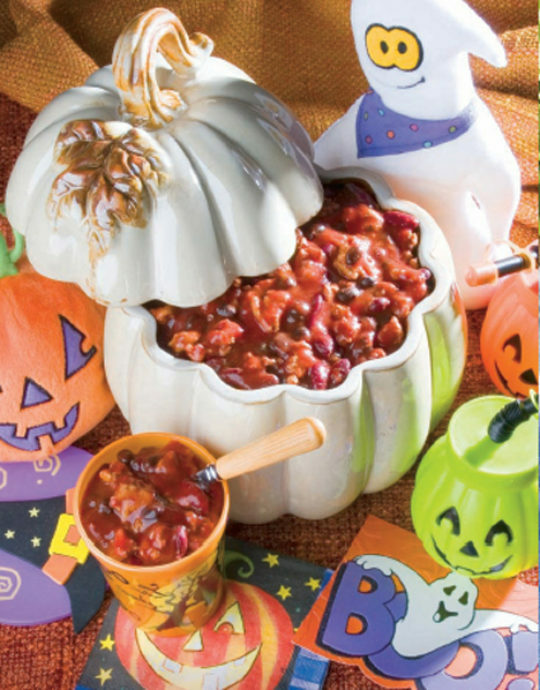 Send your ghosts and goblins out to trick-or-treat with a hearty supper like this Turkey Chili. With oregano, cumin and peppers, the youngsters will be warm all night! Heat oil in a large sauté pan. Add onion, red bell pepper and garlic. Sauté until onions are translucent. Add the ground turkey breast, salt, chili flakes and black pepper. Brown over medium heat until the turkey is cooked through. Pour the mixture into a crock pot. Add remaining ingredients and stir well to combine. Cook for 8 hours on low or 3-4 hours on high, stirring occasionally. Recipe makes 10 (1 cup) servings.